"I appreciate everybody in this law office and what they did for me"
Our client, Tina, suffered a compound fracture to her left ankle, in addition to a broken fibula and other bones in her foot and ankle, after being struck by a car while she was riding her bicycle with her daughter. Luckily her daughter was not injured, but unfortunately had to witness the tragic accident that seriously injured her mother. 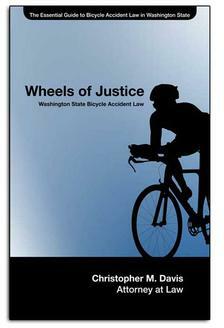 Tina hired the bicycle accident lawyers at Davis Law Group immediately after she had emergency reconstructive surgery to repair the ankle injury. We were able to recover a $160,000 settlement on behalf of Tina and her family. Me and my daughter—I have a daughter that’s twelve—we was riding our bikes. We was going to the uh, haircare store. And as we was coming back, we went by Peterson’s Food Company, and a lady was coming out with her car and my daughter was like ‘Lady, Lady! You’re gonna hit my mom! You’re gonna hit my mom!’ and I don’t know if she heard my daughter say that or not, but we clashed. When I went to the ground, my ankle went the other way—turned all the way, like, almost like clockwise, around. And when I went to the ground, my ankle was dangling from my—my bone was dangling from my—it was bad. And then I went to the hospital and got to the hospital and as soon as I got to the hospital, I went right into emergency surgery. And uh, then a couple of weeks after it healed, that time for it to heal, and then I had a second surgery. My experience today is that I won’t ever ride a bike with no helmet. And you know, I wanna ride my bike again. I’m gonna get back on my bike, and I’m not gonna let this hinder me from being a bike rider. It’s an experience I’ll never forget—I’m gonna remember this for the rest of my life, being hit by a car. And this ain’t my first time riding a bike, I’ve rode a bike my whole life. But that’s the first time I’ve got hit by a car on a bike, and I didn’t think that could happen on a bike, but now I know it can. It was amazing. Um, I um, told Zee, ‘whatever happens in this case, just don’t let me get shafted by these people. Just don’t let me be the one to get shafted. Because I’m the victim.’ You know, I’ll always be the victim of that, you know? So she worked hard and she got me what I deserved and I appreciate everybody in this law office today, and what they did for me, and I’ll not forget my experience with them.